Brian Ross, the director of events at UC San Diego’s all-ages nightclub, the Loft, has a penchant for organizing double-bill concerts that pair local acts with international touring stars -- and the consumer usually comes out ahead in such arrangements. 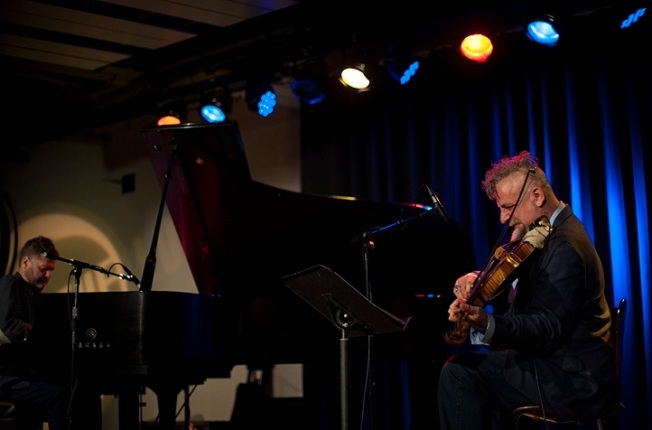 On Sept. 30, the opening act of pianist Anthony Davis and bassist Mark Dresser very nearly stole the show from the visiting headline duet of Romanian pianist Lucian Ban and NYC string specialist Mat Maneri. Of course, Dresser and Davis have a symbiotic relationship that goes back to the mid-1970s, so it would be almost impossible for any duo to match the degree of intimacy they have earned through time. Right out of the gates, Dresser and Davis forced an expansive canvas in which angular, jagged chords sidled up against rubbery glissandi and an arco that was equally profound in fundamental and overtone. Davis’ fingers flew across the keys while the bassist toggled between a manic walk and strummed triplets. The two musicians have a rich enough history to engender all manner of balanced dialog. When Dresser went high on the fingerboard, Davis usually countered with rumbling, crashing chords in the left hand. Each player was able to transition from soloist to support and back with seamless surges and exchanges of kinetic energy. In an evening of stellar moments, my personal favorite went down in the Davis closer, “Whose Life?” where the majestic sense of orchestral pacing built to an irresistible series of climaxes, as each player swayed hard to an inevitable guiding pulse. Out of nowhere, there was a surrender to the blues and everything took on an even deeper meaning. The release last year on ECM of "Transylvanian Concert" marked a highlight of the label’s catalog, and this concert had been circled in bold on my calendar for months. This duo concentrates on the shadows cast by gypsy scales and slow, aching glissandi, well represented on the opening “Not That Kind of Blues,” which, title notwithstanding, turned out to be precisely that kind, with an extra emphasis on rumbling ostinatos, wide vibrato and high doses of drama. Maneri’s viola fluttered with a wild gurgling sound, while Ban tended to more lyrical fare along the lines of Keith Jarrett’s groundbreaking 1970s work. After a truly strange read through the Sun Ra classic, “A Call for All Demons,” the duo concluded with another piece from their ECM debut, “Monastery,” where sparks flew, drawing out the best -- and wildest -- input from both players.